Who doesn’t fall in love with bikes? All adventure-lovers out there cycle their way to places they go to. All the cool people gather in tours and triathlons. All fitness enthusiasts pedal as fast as they could. Ever since the 1800s, bikes have been in the spotlight. Even when they’re beginners, cyclists are never in the spotlight of shame. Yet it would truly be a shame if you are a full-pledged cyclist, who knows nothing about single-speed and geared bikes. Don’t worry, you are now in good hands. It is never too late to educate yourself about these two. So, keep rolling! When you were a kid, your parents gave you your first bike which came with training wheels. Those kinds of bike are predominately single-speed. But it is important to note that single-speed bikes are not only for kids learning to cycle. These bikes are chosen by cyclists because of their amazing features –stripped down pure simplicity and efficiency. This type of bike has no derailleur’s, chain rings, cogs, or cables making it lightweight and really easy to maintain. Plus, no clanging to distract you! As you ride your single-speed bike, your effort in pedalling is directly converted into forward propulsion. Another awesome thing is that you do not have to pedal like crazy when going downhill. The lightness of your single-speed bike makes it so much fun to ride. Most of all, single-speed bikes are minimalist yet sleek in design. People who see you ride your bike will surely drool for it. Thanks and praises to your single-speed bike! What are geared bikes, then? As the name suggests, geared bikes are all about mechanics. 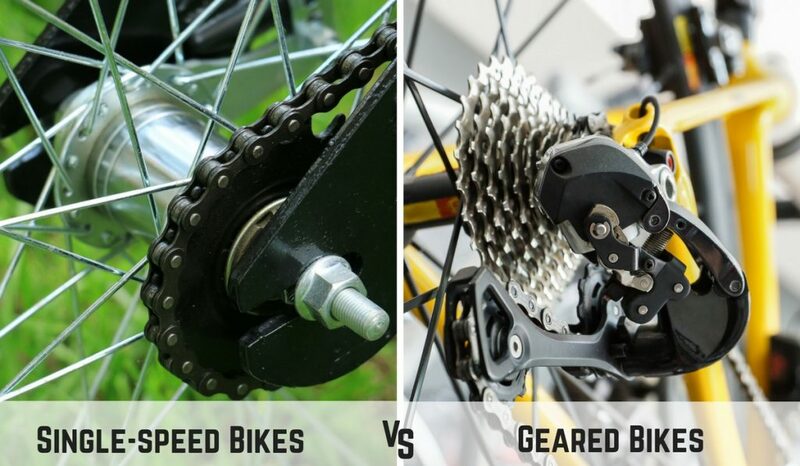 Cycling lovers have probably taken their time in mastering how each gear works. Like, for example, tension is kept on the chain of geared bikes. This is possible due to its spring-loaded arm. Compared to single-speed bikes, geared bikes have a cable attached to the shifter, derailleur arm, cassette, and chain ring. The beauty that geared bikes offers is showcased extensively when you ride it. The energy you give when you pedal is the same energy that your geared bike can show. With this, you really get to feel that you are in sync with your geared bike. You will feel like cycling with your best friend. While best friends are the sweetest, however, your geared bike is the toughest. It is perfect for the urban setting, even uphill, and can withstand any weather condition. The outstanding mechanics that geared bikes have can blow you away. They boost your cycling performance on sharp inclines – of course, at high speeds! You do not have to worry if you can achieve looking like a pro when you are still a rookie. Since you have the perfect geared bike, you can. You just have to take some time practicing. Having been informed about what single-speed and geared bikes are, have you made a choice? Stead Cycles is the leading provider of high quality bikes in Australia. With over a decade of expertise, we assure you that you get only the best bikes. Call us at 4966 2141. We highly recommend that you pay us a visit at our store in Beresfield. We have a huge range of stock and lots of suppliers. If we don’t have the bike you want, we’ll try our best to get it for you. Get in touch today!